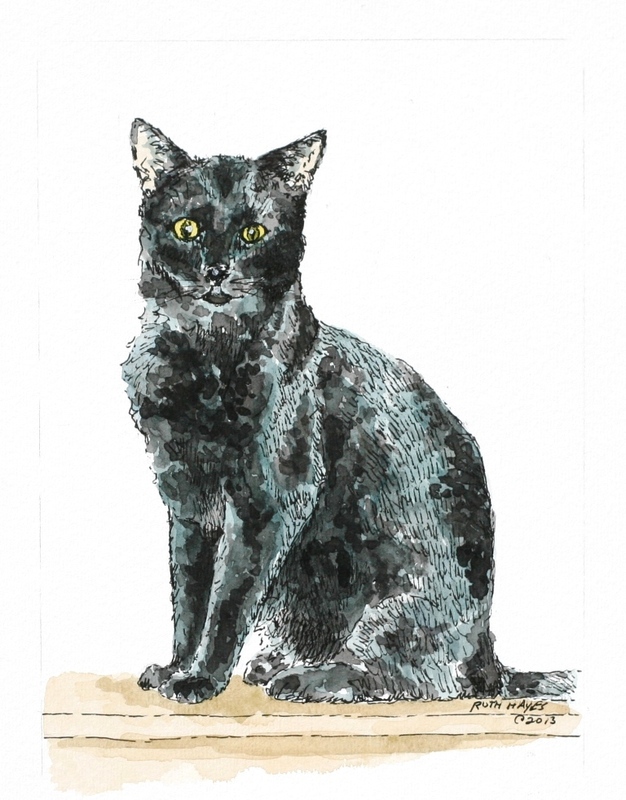 Our cat Perkins was named for a grey cat in the children’s book “The Castle of Cats”, one of my daughter’s favorite childhood books. 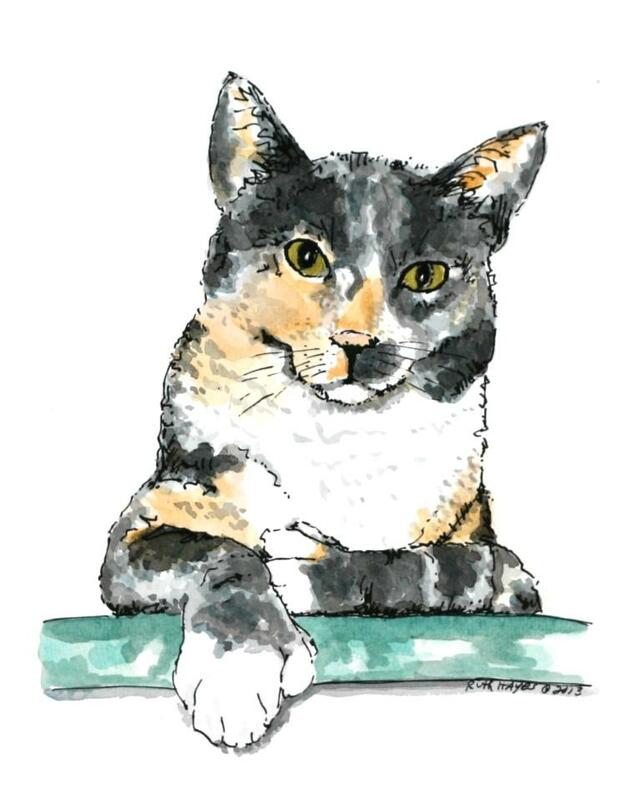 She was a typical tortoise-shell cat with a grey/pale orange/white coat, except for the six toes, just like Hemingway’s cats. She looks rather innocuous in this portrait, but I called her Crabby Cat. We got her as a kitten when the kids were small and they grew up together. I show her here, perched on top of the water heater in the laundry room off of the kitchen. She liked the out of the way place it was located and I think jumped up on it from the washing machine. I’m sure that the warmth that it gave off was quite an incentive too. She wasn’t particularly sociable, but she did like warm feet. The only time she consented to sit on anyone’s lap was in the dead of winter when she got cold. You could feel the iciness of her foot pads right through your pants. Only brief patting was allowed; then she just better be able to sit there and get warm. Picking up was not usually permitted. It wasn’t as though she was a biter when she got annoyed. She just preferred interactions on her own terms and she definitely let you know when time was up. She never broke any skin, but after she had enough (which never was actually very long) you got the point. Even the dog knew not to mess with her. She was a cat to look at more than to play with. I have heard that this aloofness is common for calicos and tortoise shell cats and now that I have looked for it, I believe it is true. I definitely like this piece more than the black cat ones. That dark color was really HARD and allowed for very little subtlety. I am not unhappy with the way the two turned out, but this one gives me a bit more confidence in selling pet portraiture. This looks like Perkins, even to me. My fingers are a bit sore today. I have spent the last several days doing morning weeding in the flower beds, The weeds and crabgrass took over the hillside when I was too busy to attend to them and I am paying the price now. I try to fill up the wheelbarrow daily and have made quite a bit of progress. Maybe I will actually meet my September 1st goal of having it presentable. Not weed free, mind you, but presentable. We haven’t had rain in quite a while so the ground is very hard. I have to dig up the dandelions with the trowel, but the shallow rooted grasses seem to pull up somewhat easily. Alas, my hands can only take so much and I don’t want blisters. I worked inside on the two cat portrait during the heat of the afternoon. 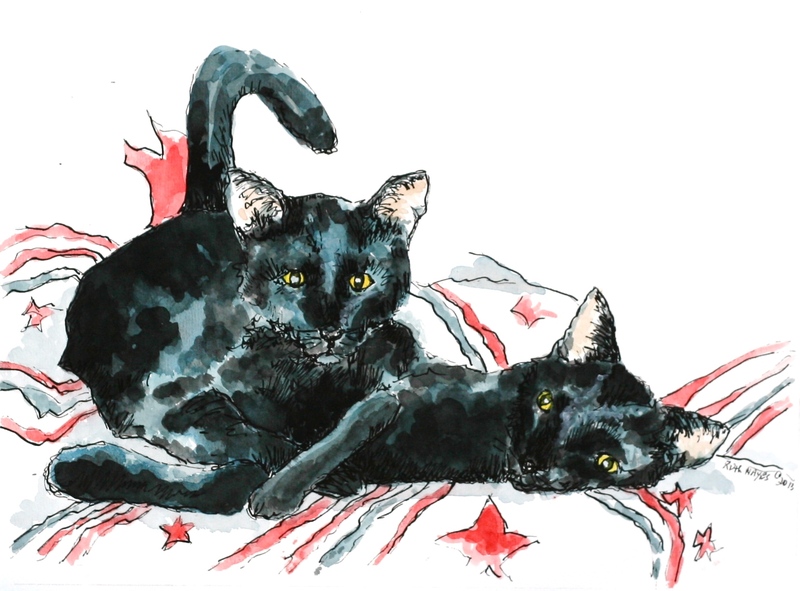 They are rescue cats who found a wonderful new home and once the first one got over the shock of having to share his good fortune, they became good friends. The bigger one does like to take advantage of his size and sits on his “brother” when he can, but all in all, they seem to enjoy playing together. They can be a regular thundering herd as they chase each other around the house. I think that, all in all, I prefer to do the dog portraits, but these haven’t turned out too bad. I think I will try one more cat portrait of just the head and see where to go from there. I have been thinking about adding pet portraits to my etsy store in time for the Christmas season. I am a bit hesitant to do this as capturing living portraiture is a lot different than working on brick and mortar construction. I was pleased with the portraits I did of Ding Dong Dog and The World’s Best dog, so I thought if I was able to do a black cat acceptably, I would consider it. This is not quite done as I think I want to do more on the background, but it is basically finished as far as the cat goes. Black cats are very hard to photograph well enough to get the details I need to be able to see and this was no exception. I tried to delineate his body with the pen and ink and add texture with the watercolors without getting overly bogged down in the details. I am now working on a pair of black cats and after they are done, I will make my decision. What do you think of this little guy. Here are links to some of the other animal portraits. 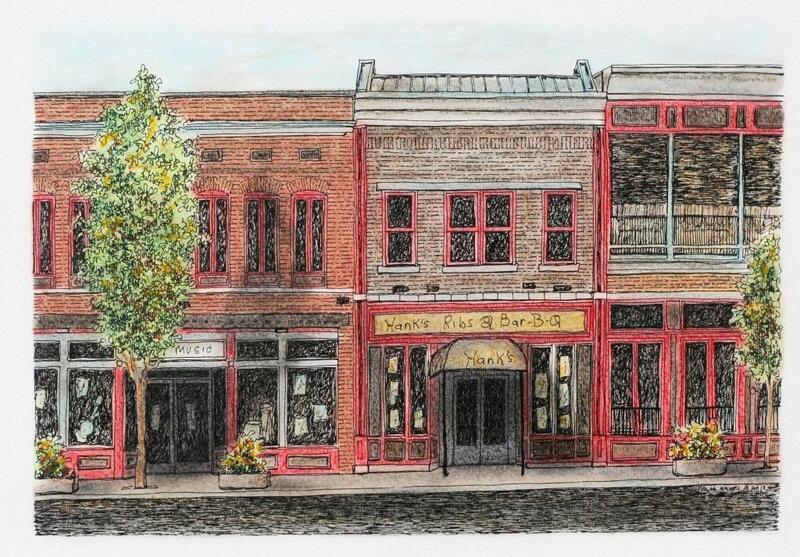 Here is the latest piece colored in with the pastels and lightly sprayed to help pop the colors. I am thinking I may darken the trees a bit more and play with the shadowing somewhat yet. There were actually no trees on the original photo, but I decided that I would add some to soften it. Old downtowns should have streetside trees anyway, don’t you think? 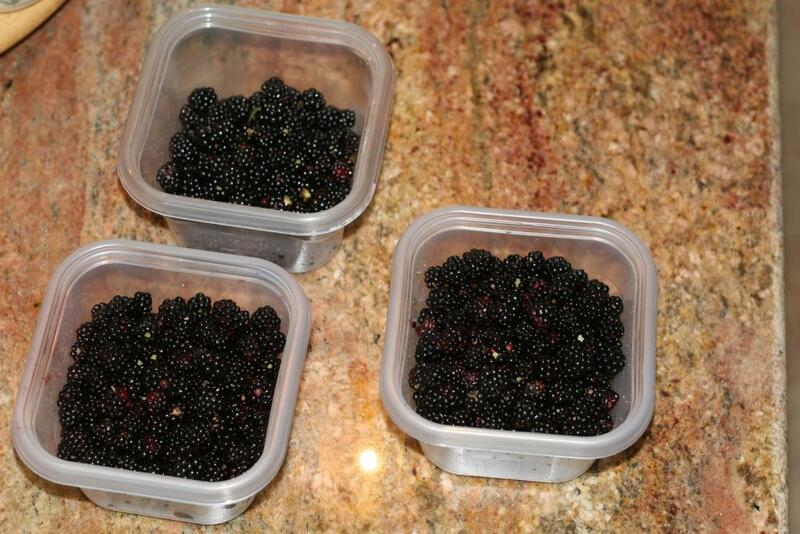 This is also blackberry season. As you can tell, I have been spending several mornings a week out in the blackberry patches. Surprisingly, the berries are not quite a good as during last year’s drought. I think it has been too cool and wet to have a bumper crop. I did manage to find this year’s location with larger berries, but none of them are quite as tasty as in 2012.